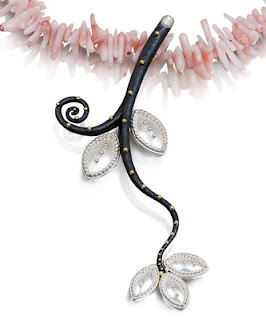 From monitoring a huge collection of Pinterest boards, I have detected a number of trends in jewelry this year. 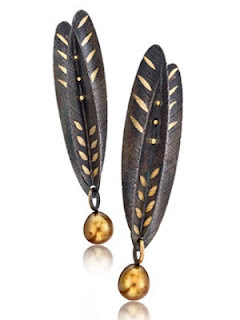 I keep in mind that I don't really follow the fashion runways or the bridal jewelry world, but gravitate more towards art jewelry and hand-crafted one-of-a-kind contemporary jewelry. I decided it would be fun to examine several of these trends. Stones are everywhere, and one of the hottest trends is mixing a multitude of stones into a single piece of jewelry. 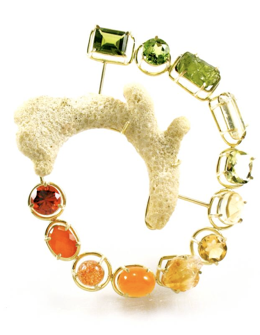 Think of Joanna Goldberg's basket-set gems in rainbow collections. All shapes and colors, precious or not, faceted to cab, with the unity coming from the settings and the flow of colors. 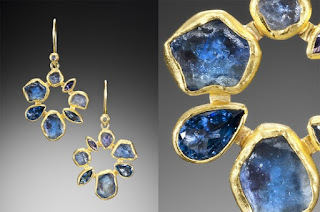 Another jeweler leading this trend include Petra Class, who typically bezel sets stones in 22k gold, but stays within a single color family with more rough cut stones. Sydney Lynch also uses mixed stones in her popular cluster necklace series. 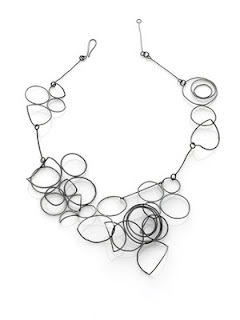 Perhaps the cost of metal is leading artists to explore working with less, by utilizing structures built of wire or heavily pierced sheet. 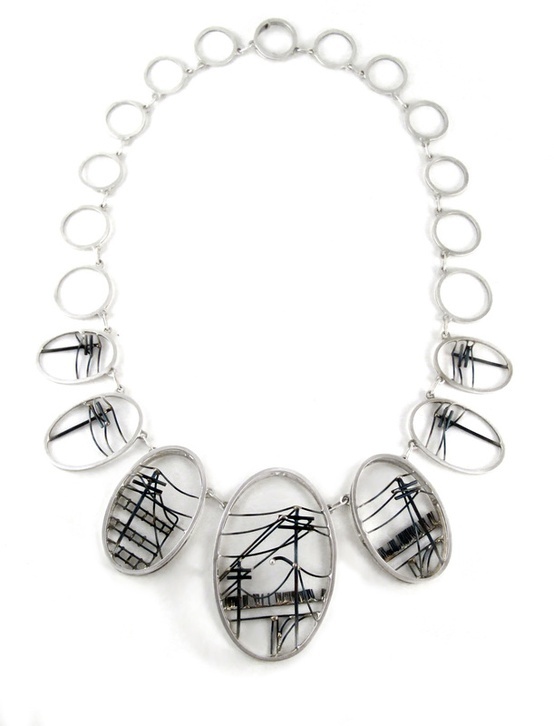 The line drawing working in silver by Caitie Sellers epitomizes this direction. Amy Tavern also fabricates simple structures from wire and sheet with a minimalist aesthetic. 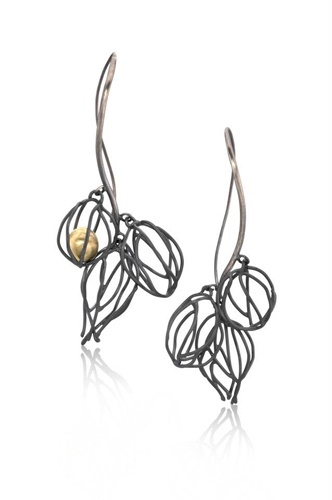 The naturalistic forms of Beverly Tadeau's jewelry certainly have a lightness to them. Rather than fighting oxidation on silver, artists are embracing it, especially in combination with gold. Christine MacKellar puts patina to great use to contrast with 18k gold and gold pearls. 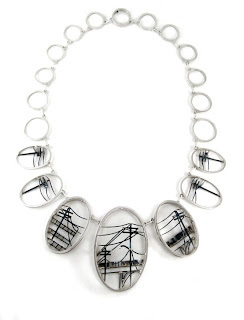 Patricia Tschetter utilizes the low tarnish properties of Argentium sterling to get both white and black silver to contrast with gold accents. 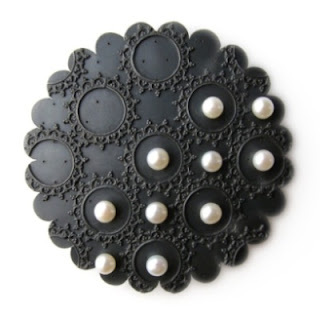 Oxidized silver also contrasts beautifully with light colored stones and pearls, as in this brooch by Marianne Anderson. Well, I hit publish early, so I'll continue the trends in another post. Impressive all of these. I do like the patinas. 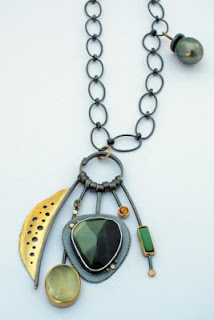 Gorgeous work by these talented designers, I love Marianne Anderson's work, we have her collection in the Gallery I work in. I'm a big fan of the Oxidized silver with gold accents, love that combo.